When marketing to freemium users, you treat your free users like customers who you’re trying to delight , thus inspiring their continued use of the product, as opposed to as prospects you’re trying to convert through the funnel. But the freemium funnel is still a funnel. Because this immersion into the product changes how you communicate with your prospects and how they move through the buyer’s journey, the content strategy driving conversions needs to be adjusted as well. Ideally, you’ll only have one funnel to work with. However, if there are multiple ways to purchase a product, you’ll need to have multiple funnels to accommodate the different purchase methods. In the case of freemium software, prospects usually have two paths to becoming paid customers. The first path is directly purchasing the paid version. The second path is signing up for the free version first and later converting into customers through the platform. Because prospects have two separate ways to convert, you'll need two funnels. The first funnel is more traditional, consisting of actions that take place outside of the product, where the prospect goes through contact lifecycle stages. The second funnel occurs within the product, where the progression toward buyer-readiness is measured by actions that take place within the product. In this funnel, prospects become product qualified leads (PQLs) instead of MQLs or SQLs. Your first strategy should involve the interactions that occur on your website, social channels or email streams, independent of your product. Your second strategy should be geared toward the users progressing through the freemium version of your product. A prospect's initial use of the free version of your product doesn’t always indicate they’re going to upgrade or convert. While the goal of product-led growth is to delight users so much with the free version that they'll convert on their own through the freemium funnel, you still need to incentivize them to explore your product offering further. You need to encourage users to utilize more features or bring on more users and obtain maximum value from your product — and if you are encouraging conversions within a product, you need a content strategy around those conversions. That strategy can include outreach outside of the product, such as emails triggered by certain actions within the product. It should also be built into the product through pop-ups, banners or tutorials. There are some parallels between customer marketing and in-product freemium marketing in this regard. Customers become “product-qualified” through their use of products or services (a different sort of measure of interest and fit) and you should try to focus your marketing efforts on making sure they’re extracting the most value from your product. You shouldn’t send them materials on the features they’re already utilizing, unless these materials describe how to use those features even more effectively. Instead, send them new information on how they can use the rest of the product. After all, you wouldn't try to upsell an existing customer on a service or product they'd already purchased. To develop a content strategy within your product, you need to first have a lead scoring system in place. 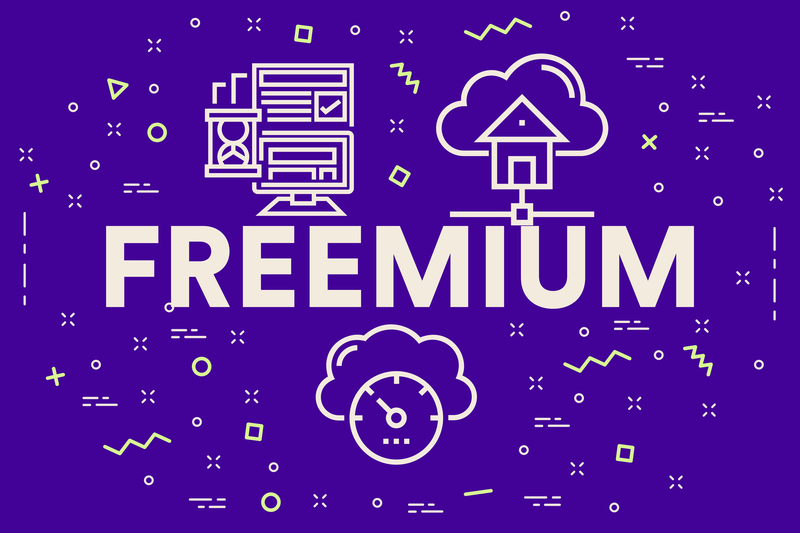 The movement through the freemium product has to be organized in such a way that the actions users take indicate their progression toward becoming a paying customer. You need to know what those actions are, how much weight you want to assign to them, and what that means about the status of any user. 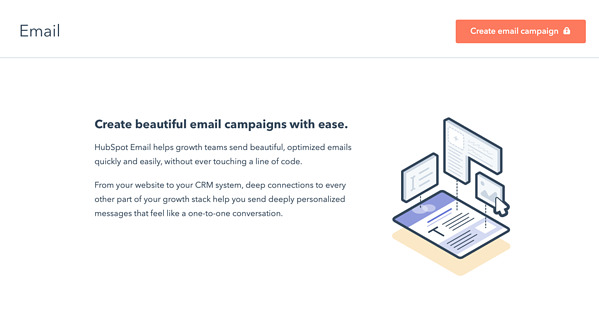 For example, a marketing automation platform might consider someone who has sent 5 emails through their platform a PQL 1 and someone who’s sent 12 emails a PQL 2. To understand what actions indicate buyer-readiness, you need to understand the core offering of your product. For example, the core offering of most video hosting platforms is how many videos can be hosted; for CRMs, it’s the number of contacts. Understand what actions convert people from free users to paid users, and then identify where the best places within your product are for placing content encouraging those actions. Part of developing this strategy is also conducting a conversion audit to analyze what you’re currently doing to drive conversions within your product. What triggers exist? What copy is around those triggers? If there’s nothing, you have a lot of gaps to fill. If you have some conversion points, then make sure all those flows are built out and connected within your automation system. The process is similar to that of a website: map out the user’s journey within your product. Have an architecture laid out and understand which features people do and don’t use. Know what features tend to be used in what order. Gain a complete understanding of the product’s build and the user’s journey within it so you can understand what copy should go where. Once you have that mapped out, you can begin the content creation process. It’s easy to neglect the way your brand is presented in your product and how conversion points are positioned throughout when focusing on product utility, but having consistently easy-to-understand, concise copy improves the user experience. There’s value in being semi-educational while still keeping it simple. A pop-up that asks, “Did you know you can also____? See how!” can provide insight into other ways users can get the most from your product without being overly intrusive. When crafting your copy, think about not only how you can encourage purchase-indicating actions, but also how can you create a more delightful experience for product users. That delightful experience requires options — with constraints. Users should have the option to never see a certain message again. In addition to an actionable button and a way to exit the message, add “show me later” and a “never show me this message again” options where appropriate. To provide contextually relevant content, you need to really understand how people move through your product and what actions they’ve already taken, so they don’t keep receiving the same messages or don’t see content promoting actions they’ve already taken. Conversions within the product are an obvious difference between a freemium funnel and a traditional funnel. But you can rely on traditional funnel tactics to support your freemium conversions, as well. You should still create additional content informed by actions taken within the product — content you then share through traditional channels, such as email. For example, if you define a PQL as someone who uses six of your product’s 10 features, you can market to them the same way you’d market to someone in a traditional segmentation strategy — you just have to ensure the stages are being reported from your product to your marketing automation platform to inform the most helpful content. You don’t want people to receive content about the six features they’re already using. You want to provide them with info on how they can use the remaining four that will convert them into a customer. There are bound to be things you want to give people information on that won’t fit within the product unobtrusively, and communications outside the product can provide that content without detracting from the user experience. Tutorials and messaging within your product goes beyond product marketing and product design to contribute to delighting your users and customers as part of your overall marketing strategy. Your content marketing shouldn’t stop when prospects become freemium users — it should become integrated into the product. Your content strategy should expand to envelop conversion points within the product to help your users extract value as they use it. 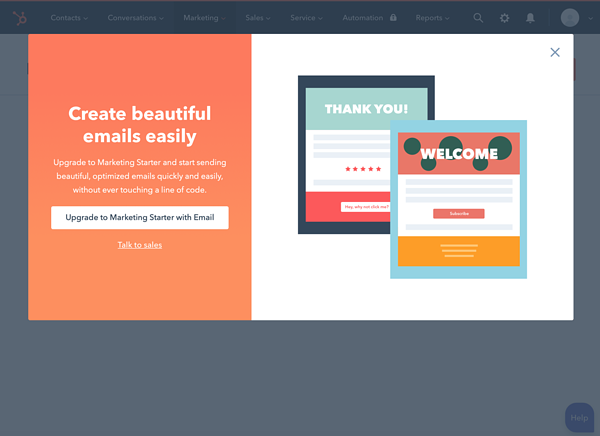 HubSpot does a great job of this through their pop-ups and tutorials. When you navigate to a feature you haven’t used before, they explain what the feature can do and market that feature to you. The feature page has a button with actionable language to encourage you to get started, in addition to a help chat if you have questions. Then, if you try to use a feature you don’t have access to, HubSpot shows a pop-up to educate you and promote action. In the example above, the user has the option to exit the pop-up, click the “upgrade” option to visit the pricing page or directly contact sales. HubSpot also encourages the exploration of their products through their HubSpot Academy courses. In addition to courses about the Inbound Methodology that are open to anyone, HubSpot also offers specific certifications related to their platforms, requiring additional use of their platform. Those certifications encourage users to become more familiar with the platform’s offerings and incentivize that exploration with shareable badges. These marketing efforts are part of how users engage with HubSpot’s Platform, but are still a part of the content strategy. If a user doesn’t understand what value they’ll gain from upgrading and having access to more features, they won’t convert — so clear, concise, informative copy is a must. From the content creation perspective, marketing through a freemium model doesn’t differ that drastically from a traditional funnel: the biggest difference is the use of the product as a channel.